Six years ago, BYU played the game that inspired me to start this blog. The Cougars went down to Texas to face #3 Oklahoma and the reigning Heisman Trophy winner, Sam Bradford. Unbelievably, they won that game 14-13 and I felt so good about it that I was compelled to write about it. This weekend, the Cougars went down to Lincoln to play one of the most storied programs in NCAA football history. You know, the type of program we were all hoping to play against when we went independent. An amazing venue. An amazing opportunity. We went in, we played, and we won the game. No, we didn’t topple the #3 team in the country. But we did beat yet another P5 team in a historic stadium, in what could be described as a miraculous fashion. And I almost missed the whole thing. For more than 15 years I have planned EVERYTHING around BYU football. I’ve changed work schedules, vacation schedules, even elementary student regional chess tournament schedules–all in an effort to make sure I can enjoy every single minute of BYU football. But this weekend, we were heading out of town. It was originally meant to be Friday, but got pushed back to Saturday. I knew BYU was playing. I knew they were playing Nebraska. But I got in the car and I didn’t care if I missed the whole thing. Football is hard. It builds up your hopes and dreams, strokes your ego, encourages you to put down serious money on what you know is a sure bet (speaking figuratively on the money here). And then, it rips the beating heart out of your chest and leaves you wondering how you’ll ever go on. Winning four straight games to start a season will build you up. Especially when you steamroll Texas on the road. Losing your star QB and dropping four straight is football’s way of giving you a gut-check. The team responded by figuring out how to win again, and ended the regular season with 4 straight W’s. But then we lost to Memphis, and the offseason was soured, at least for me. Living in the Pacific Northwest, I know I’m in the minority as both a BYU and a Seahawks fan. But It relates to my message today, so bear with me. The Seahawks were primed to repeat as NFL champions last year. They had a miracle comeback win against Green Bay. They were down against the Patriots in the Superbowl, but Russell Wilson drove them all the way to the 1 yard line, and I knew they were going to repeat. Two years of Taysom Hill season-ending injuries and a doomed goal line pass play finally wore me down to the point that I didn’t care about the start of football season for the first time I can remember. We arrived at the in-laws on Saturday. Pretty soon everyone else had left to go to wherever, and I was left alone with a TV on a college football Saturday. I figured the BYU game was long over, so I flipped to ESPN to see if I could find the highlights. This subscriber does not have ESPN. Wut? So I found a game on a local channel, and there in the scrollbar it showed BYU 24, Nebraska 28, in the 4th quarter. I grudgingly switched to ABC to watch the end of the game. I was simultaneously confused and excited that Tanner Mangum was in the game. I have been his fan since he stole the show at the 2011 ESPN Elite 11. He was deadly accurate, winning the Golden Gun award every day of the competition. I remember thinking at the time that I really hoped the QB’s ahead of him would clear out so he could play right away. I didn’t understand then that his playing meant Taysom was injured again. But I was delighted to finally get to see Tanner play. And I was happy to see the nearly 22 year old “freshman” lead our team to a field goal and then the last second Hail Mary for the win. Seeing the end of that game brought me back to you today. “The play” had me out of my seat, spilling my Diet Coke, and screaming at the top of my lungs for nobody but me. All because one kid threw a ball to another kid in Lincoln, Nebraska. No one can really quantify how much we lost with Taysom Hill’s latest injury. He is truly an amazing player. Probably the only thing that could make him better is Wolverine’s quick healing ability and adamantium skeleton. You gotta feel for him. It’s a devastating loss that came along with the W. Because football is not easy and your team will not win the championship every year. Even our big win came with a great loss. But the win also brought back something else. Hope. We won on the road against a P5 opponent. We were short several players due to injuries and suspensions. We were down to our backup quarterback. We had one second on the clock and nearly half the field to cover. And we won. And if we can win in that scenario, we have more than enough reason to hope for a favorable outcome in every game this season. And I’m sorry John Lennon, but for this football fan, HOPE is all you need. I know Tanner wasn’t planning on being the starter this week, and I would love more than anything for him to have been Taysom’s backup this entire year. But of all the freshmen quarterbacks in the country, I’m glad Tanner Mangum is who we’ve got under center. I’ve been excited to watch this kid play for us for years, and his time is now. 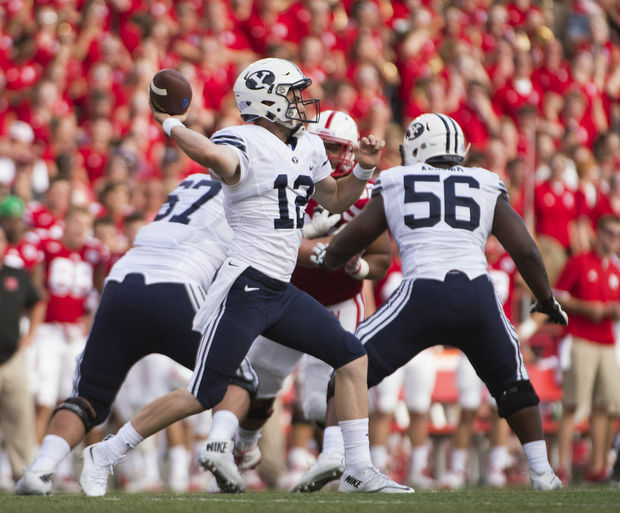 Thank you Tanner Mangum for bringing me back to the game and back to this blog. Thanks for giving me hope, and reminding me that while sometimes football rips your heart out, sometimes it also feels like this. Give ’em hell this week.